Your pets provide you with hours of enjoyment and company. You take good care of your own health, and now you can make sure your animals have quality supplements to support good joint health as they age. Twenty-five percent of all dogs will develop joint ailments of some kind. K-9 Glucosamine contains essential nutrients shown in clinical studies to prevent or dramatically improve the condition of animals suffering from joint problems. For younger dogs, glucosamine and chondroitin aid in the prevention of arthritis, while MSM promotes general good health. Supplements in liquid form are shown to be absorbed more quickly and efficiently than tablets, offering faster results. 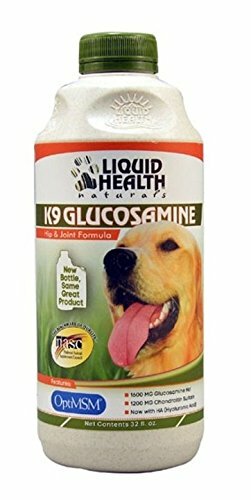 K-9 Glucosamine has 62 percent more glucosamine and 50 percent more chondroitin. It also contains OptiMSMTM, which has been ultrapurified and distilled to provide the purest form of sulfur needed for structural integrity of joint cartilage. Standard MSM is tested for lead, arsenic, cadmium, and mercury at 10 ppm. OptiMSMTM is tested at 1,000 to 10,000 times greater sensitivity to ensure less than 0.01 ppm to .001 of these contaminants. 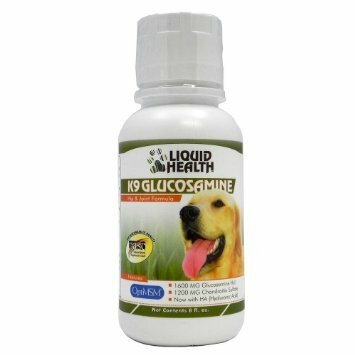 K-9 Glucosamine provides you a convenient way to offer high-quality glucosamine, chondroitin, and MSM to your dogs and horses. 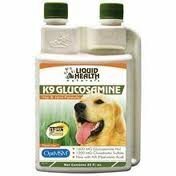 K-9 Glucosamine Liquid Vitabase Has been clinically shown to prevent and improve joint ailments in animals. Aids in prevention of joint problems in younger animals. Provides liquid form that is more quickly absorbed. Offers high concentration of glucosamine and chondroitin. Proves beneficial for horses also.